Our Yoga Mat Harness Straps are an artistic way to showcase your awesome yoga mat if you aren't sure which size/style yoga mat bag you'd like. They are also perfect for the minimalist! Yoga mat straps are simple to use: two adjustable quick release pinch buckle attachments on each side, with a reinforced sling-style strap in the middle. Open design allows your yoga mat to breathe and air out after a steamy practice. Strap is one inch wide and has purple, red, teal, and black triangular art deco stitched design on top. 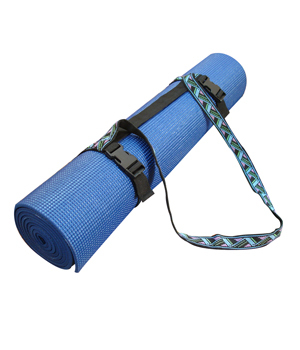 The most economical choice to carry a yoga mat is a Yoga Mat Harness. Each lightweight yoga harness has two adjustable, quick-release buckles, making it equipped to hold yoga mats of any size. The strap is solid, durable, and reinforced for long life and comfort, guaranteeing it will last for years. Each harness arrives individually packaged. This strap is really great for what it is. Simple with a cute design and it gets the job done. The harness strap works well with the thicker mats and is easy to use. This is a good strap that makes it easy to carry my mat around. It was plenty big enough for my extra long mat. works fine, adjustable to accommodate thicker/longer mats. i don't personally care for the pattern but it works just fine and gets the job done. Started a Yoga class twice a week 3 months ago and the standard mat was not cutting it for me since I stand 6'4". This mat does the job, long enough, wide enough and cushy enough too. Gave it a quick was and air dry and works great. This strap was perfect for me because I have to bike 3 miles to get to my local yoga studio. I was worried that it wouldn't be big enough to hold my extra long/ extra thick yoga mat, but it fits perfectly. Also, the color seems feminine in the picture, but the pink is actually a darker purple color. I really like my yoga harness strap. It makes carrying my mate so easy and convenient to grab and go.